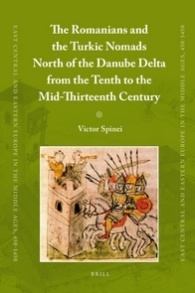 To my surprise, Nora Berend, who—to the best of my knowledge—never concerned herself either with the territory north of the Danube Delta or with medieval archeology, has written a review of my latest book, Romanians and the Turkic Nomads North of the Danube Delta from the Tenth to the Mid-Thirteenth Century (“East Central and Eastern Europe in the Middle Ages, 450-1450”, 6) (Leiden/Boston, 2009), for the Medieval Review 11.03.14. The book was published by Brill, an academic publishing house with a long record and a strong international focus. It is not as much the lack of minimal knowledge of the history of medieval Moldavia which astounds the reader of the review, as the outpour of misinformation and a hardly veiled bias against Romanians. Berend has nothing good to say about the several hundred pages of my volume. As a matter of fact, there is no appreciation whatsoever for any bit of information or for any interpretation, and instead Berend self-indulgently highlights several real or imaginary errors. She can still remain satisfied that the translation and some formulations can be found to be unfortunate. Berend does not even mention the first section of the book, in which I have for the first time reconstructed the historical geography of the southern half of medieval Moldavia. Nor is Berend interested at all in the last chapter, which deals with hundreds of anthroponyms, place names and common terms of ancient Turkic origin pertaining to the Romanian territory and neighboring regions. In order to compile that list, I have painstakingly scoured through a large number of medieval charters and documents of the early modern age. In doing so, I have pointed to issues and details never before raised in historiography. Equally neglected in Berend’s review is the archaeological material on which the book’s conclusion is largely based. I am unable to tell whether ignorance or incompetence is to blame for this lack of interest, but it seems to me that the real reason for Berend’s writing her review was neither to present my book, nor to analyze its contents. Her goal was instead to incriminate the author, and to proclaim guilt before any evidence would be presented in front of the jury. The example chosen by Berend to demonstrate the “very tendentious manner” in which I allegedly displayed most of the information typifies her approach: “He consistently equates Vlachs with ‘Romanians’ although the latter term and identity simply did not exist in the period he covers.” This is an altogether stunning remark, which suggests that to Berend, the Vlachs and the Romanians are two different ethnic groups. One is reminded of Stalin’s political commissars and their efforts to distinguish between Romanians and Moldavians. I, for one, do not know of any serious scholar who would subscribe to such a ridiculous claim. Moreover, if we would for a moment accept Berend’s principle, then one would have to admit that the Magyars were different from Bashkirs, Scythians, and Turks, although they frequently appear in medieval sources under those three names. Similarly, nobody should refer to Avars when they appear in sources as Huns, nor to Pechenegs when called Bessi or to Cumans when called Komanoi or Valwen. Finally, why should one stop at distinguishing between Romanians and Vlachs? After all, medieval sources also used such terms as Volochs, Wlachen, Blac, Ulakh, and Blakumen. To follow Berend’s line of thinking, one would have to admit that each one of those names designates a different group of people. The absurdity of such an approach seems to have escaped Berend’s critical attention. Be as it may, Berend’s displeasure with Vlachs being called what they were, namely Romanians, is in sharp contradiction with what a number of prominent post-war Hungarian historians have written on the subject. László Makkai, Pál Engel, Gyula Kristó, István Petrovics, Paul Lendvai, and István Vásáry used the term “Romanians” to refer to the Romance-speaking, neo-Latin population in the lands to the north of the river Danube. The term ‘Vlach’ has gained obviously offensive, pejorative, connotations in some Slavic groups. That Berend prefers ‘Vlach’ to ‘Romanian’ may have something to do with the fact that the Hungarian word for Vlachs (‘oláhok’) is an ethnic slur applied to Romanians. If so, Berend’s nationalist attitude verges on xenophobia, in the tradition of the irredentist propaganda between the two world wars. That would explain her assessment of the demographic situation in the lands north of the river Danube during the Middle Ages. Whatever the explanation, Berend has consistently ignored the Romanian population (and only the Romanians) in all her works dealing with medieval Hungary. She also completely neglected any contribution of Romanian historians to the problems of her interest. Given that some of them published their studies in languages that Berend most certainly understands, the only conclusion one can draw is that this bizarre attitude is a deliberate attempt to ignore all things Romanian. Unfortunately, that is no excuse for her lack of knowledge of both sources and secondary literature regarding the history of Moldavia. To cover her own shortcomings, Berend claims that, when dealing with political events, my book is nothing more than a mere “recapitulation” of some “well-known events.” She most definitely does not know (or understand) that many of the sources I have used for the reconstruction of ethnic and political history of the region to the east of the Carpathian Mountains, have never been used before by any historian. It goes without saying that any work of historiography, especially of a synthetical nature such as my book, is bound to rely on historical facts, which are—whether Berend likes it or not— pro bono omnium. As a matter of fact, Berend’s own works are not exceptions from that rule, and it is both sad and ironic that she fails to see that the nitpicking she directs at me can very easily be applied to her. Berend draws a caricature of my interpretation of the negative impact of the Turkic nomads upon local communities in the Romanian regions. She must believe that the demographic decline in more than a third of the territory of Moldavia, which is clearly attested in the archaeological evidence and coincides in time with the Pecheneg, Oghuz, and Cuman invasions into that area, was to the great benefit of the native society. In any case, to claim that in my book I have only seen the relations between Romanians and Turkic nomads in negative terms is simply and utterly wrong. I have dealt in several chapters with the nature and consequences of the peaceful contacts between ethnic groups, which is illustrated, among other things, by the presence of artifacts most typical for the nomads in assemblages excavated in settlements of the native population. But this is only one example of how distorted the interpretation of my intentions and of the results of my efforts can be in Berend’s eyes. According to her, I deny any influence of the Turkic nomads upon the Romanian population. Again, this is simply false: on dozens of pages I have discussed, among other things, the linguistic and archaeological evidence to the contrary. Perhaps Berend never read those pages. One is almost forced to draw that conclusion when she writes: ”Spinei discounts the efforts of previous scholars who tried to demonstrate the existence of Turkic toponyms, anthroponyms and loan-words in Romanian.” Is it at all possible that Berend simply skipped the chapter in which I deal precisely with such terms? Could perhaps Berend’s absurd remark be based on her dissatisfaction with my critical treatment of what “previous scholars” have written on that same topic? If so, it would be useful to know where Berend stands in this debate, or at least who among those “previous scholars” is her favorite. The cavalier treatment of some of the arguments I advanced in my book leads to grotesque mystification. For example, Berend claims that in order to give credit to certain events taking place in the eleventh century, I used a seventeenth-century source. The reader is left with the impression that I committed an anachronism. In reality, Berend does not apparently know that a very early Turkish chronicle named Oghuzname survives only in the seventeenth-century “Turkish Genealogy” by Abu’l-Ghazi (1603-1663). That most certainly does not make the Oghuzname a seventeenth-century source. Berend also claims that I constantly minimize the role of the Slavs in the history of southern Moldavia. Leaving aside the fact that my goal was not to write about the Slavs, the book is in fact replete with references to Slavic-speaking populations. All Berend needed to do was to consult the index, and to see the numerous page numbers next to such entries as Bulgarians, Rus’ and Slavs. If Berend knows of any episodes or issues pertaining to the history of the Slavs in the Lower Danube region, which may have been left out, she should mention them. So far, at least, there is no substance to her incriminations. According to Berend, only my “fertile imagination” could produce the interpretation of a passage in John Kinnamos referring to a mid-twelfth-century barbarian chieftain in the lands north of the river Danube. The name of that chieftain is Lazarus and on that basis I suggested that the man in question may have been of Romanian origin. Elsewhere I also advanced the possibility that Lazarus was a Christianized Cuman. In both cases, I have done no more than pointing to a possible interpretation of the odd situation in which a barbarian chieftain appears with a Christian name in a Byzantine source. My imagination may well be fertile, but Berend’s does not help at all with finding a solution to this question. She only wants to deny any possibility that the man was a Romanian, and has no alternative to offer. La critique est facile, l’art est difficile ! My book is also not about the 1185 rebellion of Peter and Asen which led to the proclamation of the Second Bulgarian Tsardom, yet Berend scolds me for “obscure uncertainties and complexities about the role of Vlachs in the so-called second Bulgarian empire.” According to her, the reader needs to consult other works on the matter, and she hastily recommends Paul Stephenson, without apparently noting that I have in fact cited Stephenson in my own book. Berend is also upset that I have dared to treat Peter and Asen “unequivocally” as “Vlach brothers”. I am reminded that their origin remains controversial, and Berend insists on the old historiographic trope, according to which Asen at least must have been a Cuman, because his name is supposedly of Turkic origin. Her insistence on the matter is remarkable, given that she has just accused me of deriving Lazarus’ ethnic origin from his name! But if following Berend’s line of reasoning, we should conclude that Almos, Arpad and Zoltan were not Magyars (or, with Berend’s permission, Hungarian), since all three names are of Turkic, not Finno-Ugrian origin. At any rate, that Peter and Asen were Vlach brothers is not my interpretation, but the information reported explicitly by several sources independent from each other, such as Nicetas Choniates and French chroniclers of the Fourth Crusade. I am sure that Berend would agree with me, if she would take the time to read those sources. Another reason for her ire is my interpretation of the passage in the Gesta Hungarorum referring to the duchy of the Romanians and the Slavs. Berend strongly believes that the work of Master P. is “a completely unreliable source for the history of the ninth century.” I leave aside the fact that such a statement apparently applies only to those sections of the text which refer to Romanians, as Gesta Hungarorum has been treated by some historians as a quite reliable source for the early history of the Magyars. This is neither the place, nor perhaps the time to deal with the much debated question of how reliable is the Gesta as a historical source. One would have to wait Berend’s own new book, so eagerly advertised in her review of my book. One will then see how her assessment of the issue will compare to that of Bálint Hóman, Carlile Aylmer Macartney, Imre Boba, György Györffy, Gyula Kristó, Sándor László Tóth, or Ioan-Aurel Pop. I will not, however, leave aside Berend’s supposed critique of my treatment of the papal bull of November 14, 1234, which mentions that the Romanians in the Cuman Bishopric had their own ”pseudo-bishops,” Grecorum ritum tenentibus. I have rejected the idea put forward by earlier scholars, according to which those churchmen were fromBulgaria, and Berend is obviously not happy with that. She does not have any solid arguments to the contrary, but strongly believes that there is “clear evidence for the ambitions of theOrthodoxBulgarianChurch in the immediate vicinity.” In fact, there is no explicit evidence concerning the extension of the ecclesiastical jurisdiction of the Church in Tărnovo to the lands north of theDanubeRiver. However, even if we assume for a moment that such an extension took place, that assumption could not logically exclude the possibility of the pseudo-bishops fromBulgaria being Romanians (Vlachs). Either way, Berend’s efforts to deny a Romanian presence north of theDanube appear as strident. The only topic covered by my book on which Berend has previously written is the Cuman Bishopric. To be sure, she did not advance any original or novel interpretation, but instead reproduced the interpretations of early twentieth-century scholars. I, for one, did not expect her to subscribe to my conclusion, according to which the name given to the diocese was not a mirror of its ethnic layout. In my opinion, the information offered by the 1234 bull suggests the existence of a Romanian population in the region, the size of which appears to have been larger than that of the Cuman population. A possible explanation for the small number of Cumans in the Cuman Bishopric is that the region in which it was located was utterly inadequate for their nomadic lifestyle. Of all scholars currently working on the Cumans, Berend should know (or remember) that King Béla IV did not settle the Cumans under Kuthen on the slopes of either the Bükk or the Western Carpathian, but in the lowlands between the Danube and theTisza. Why would the Cumans to the east of the Carpathian Mountains have agreed a different deal, and settled in a hilly, densely forested region, with few, if any grazing fields? Why would they have suddenly decided to change their way of life so radically? The archaeological evidence, which Berend so consistently ignores, definitely supports my interpretation: out of 503 individual graves attributed to the Turkic nomads, which have so far been discovered in Moldavia and Wallachia, only two (Ştiubei and Ziduri) have been found in the area supposedly covered by the Cuman Bishopric in the thirteenth century. It is difficult to believe that all Cumans residing in the Cuman Bishopric suddenly abandoned their traditional burial customs and adopted others which left no archaeological traces. Berend does not even engage with this kind of evidence. She also ignores the many settlement and cemetery sites attributed to the sedentary population in Moldavia. Her tacit dismissal of the archaeological evidence speaks volumes about her lack of understanding of what is in fact at stake. Berend seems to imagine that the identification, dating and ethnic attribution of 503 graves of deceased nomads, dissipated in 143 points, as well as the cataloguing and analysis of hundreds of settlements of Romanians and other sedentary ethnic groups, represent facile enterprises of no importance which anyone. She tries to convince her audience that my only concern in this book was to extol the Romanian contribution to the history of South-Eastern Europe. In reality, my thesis is quite the opposite: because of the migration of the Turkic nomads, Romanians played a rather minor role in the political history of the Danube region during the first quarter of the second millennium, and their economic, social, and cultural achievements were very modest. This conclusion is stated very clearly in my book, as well as in my previous studies, in which I strove to distance myself from the nationalistic historiography of Ceauşescu’s regime. I paid my price for that attitude, but I never thought that I would one day be accused of being a nationalist for having resisted nationalism. Moreover, the issues that apparently caused Berend’s displeasure play only a secondary role in my book. It appears to me that Berend capitalized on the recent historiographic concern with the deconstruction of nationalism to raise doubts about my work. In doing so, she probably believes she is justified and free from any contamination with nationalism. I believe she chose the wrong person for the job. I also think that her indirect attack on the Brill series in which the book has been published is baseless. As far as I know, the series enjoys a high reputation in the scholarly world. In short, driven by nationalist enthusiasm which blinded her critical view and unveiled her anti-Romanian bias, Berend offers a version of history surprisingly similar to that promoted by the cultural commissars of the Soviet regime. Her understanding of the role of Romanians in the medieval history of Southeastern Europe would have been recognizable to those active “in the field” under Khrushchev and Brezhnev. This should in no way be construed as an attempt to find excuses for the nationalistic sins of Romanian historians, many of whom I condemned on several occasions for their attitude at that time. With Hungary and Romania now members of the European Union, Berend’s views are not just outdated. They are in sharp contradiction with the way in which Hungarian and Romanian historians now deal with the controversial issues of the past. Berend, for instance, is upset that I have dared to criticize a number of Hungarian scholars denying the Daco-Romanian continuity in the lands north of theLower Danube. In reality, I did not single out Hungarian historians for being Hungarian, but instead discussed theories advanced by non-Hungarians as well, especially those of Robert Roesler. My intention was not to deal with the problem comprehensively, only with those who have denied the continuity of a Romance-speaking population on the territory of present-day Romania. In doing so, I had in mind scholars, who, being driven by nationalistic concerns, have most egregiously misinterpreted the evidence. György Bodor and László Rásonyi, for example, put forward the preposterous idea that the ancestors of the Romanians were an obscure Turkic group from the Ural region, named Bulaq. It appears that if she is upset that I criticize Bodor and Rásonyi for such theories, Berend agrees with him. If so, she is definitely alone in that, for no serious scholar would subscribe to Bodor and Rásonyi’s far-fetched claims. Re-reading Berend’s list of errors of interpretation in my book, I now realize that I could not even claim the title of originality for many of them. Take, for instance, my ”unequivocal” statement about Peter and Asen being Vlachs. There is a long list of scholars who wrote the same about the founders of the Second Bulgarian Tsardom: Constantin R. von Höfler, Alexander Vasiliev, Robert Lee Wolff, Alexander Randa, Charles M. Brand, Anton Hilckman, John V. A. Fine, Warren Treadgold, Andrew Haraszti, Paul Stephenson, etc. Nor am I alone in affirming the Daco-Romanian continuity in the lands to the north from the Danube River. Berend’s beef is therefore with Theodor Mommsen, Josef Ladislav Pić, Julius Jung, Robert William Seton-Watson, Günter Reichenkron, Franz Altheim, Alf Lombard, Ernst Gamillscheg, Mario Ruffini, V. D. Koroliuk, Alain Rusé, Klaus-Henning Schroeder and many others. According to Berend’s judgment criteria, all of the important scholars mentioned above would certainly be a mass of unconscious conveyors of “nationalist myths”! In conclusion, I can only note that given the opportunity to criticize what she believes to be nationalism, Berend has offered her own strident version of the same, combined with offence, deliberate misinterpretation and mystification. Whatever one chooses to think about her political views, this review cannot support her credentials as a scholar. That is why she deserves my compassion. In an online entry of the Medieval Review (hereafter, TMR) dated 2012.01.23 (https://scholarworks.iu.edu/dspace/bitstream/handle/2022/14200/12.02.23.html?sequence=1), Nora Berend offers a bizarre response to my reply (TMR 2012.01.19, at https://scholarworks.iu.edu/dspace/bitstream/handle/2022/14153/12.01.19.html?sequence=1) to her initial review (TMR 2011.03.14, at https://scholarworks.iu.edu/dspace/bitstream/handle/2022/13060/11.03.14.html?sequence=1 ) of my book, The Romanians and the Turkic Nomads North of the Danube Delta from the Tenth to the Mid-Thirteenth Century (Leiden/Boston, 2009). According to the TMR rules, an author has the right to just one reply, which is why this text is now published here. I found it necessary to write this text in order to get the record straight. To be sure, in her response Berend abandoned the highly xenophobic tone of her initial review, but in my opinion she reinforced the general impression one gets about her incompetence in matters of the archaeology and medieval history of the Romanian lands. In an attempt to justify her interpretation of my own analysis of the archaeological material pertaining to the region to the east and south of the Carpathian Mountainsduring the tenth to thirteenth centuries, Berend invokes the name of Siân Jones, the author of The Archaeology of Ethnicity. Constructing Identities in the Past and Present (London/New York, 1997), to claim, I suppose, that ethnicity remains to this day a controversial matter for archaeologists. Leaving aside the fact that, far from being an agnostic in such matters, Siân Jones in her book in fact advances a model for the archaeological study of ethnicity, there are many more controversies revolving around the ethnicity of several populations mentioned in the written sources. For example, who really were those Latins, Franks, Scythians, Huns, or Turks? If, as Berend seems to suggest, we should give up any attempt to link the archaeological record to ethnic groups known from written sources, why not give up on all ethnic names mentioned in those sources? Moreover, why excavate in the first place? Nora Berend does not apparently know (because she probably did not read the book) that such an extreme agnostic position is not advocated by Siân Jones, but by Sebastian Brather (Ethnische Interpretationen in der frühgeschichtlichen Archäologie. Geschichte, Grundlagen und Alternativen, Berlin/New York, 2004). Nor is she aware of the debates surrounding Brather’s book in which his point of view has been put in sharp contrast to Jones’s position. The question of ethnicity in medieval archaeology is currently a much discussed one and the agnostic position embraced by Berend is rejected by almost everybody who has an understanding of the cultural construction of ethnicity in the past, as well as in the present. Berend completely ignores the debate (and such names involved in it as those of Heiko Steuer, Patrick J. Geary, Florin Curta, and Falko Daim), and should have stuck to her own trade, rather than taking a risky walk through unknown territory. Instead of recommending books that she obviously did not read, it would have been more profitable for her to indicate which specific ethnic names should be considered from among many appearing in sources pertaining to the territory of Moldavia. Mats Roslund’s book (Guests in the House: Cultural Transmission between Slavs and Scandinavians 900 to 1300 A.D., trans. A. Crozier, Leiden/Boston, 2007) is based on an approach very similar to the one I have adopted in my book, to the extent that Roslund attempts to identify the Slavic presence in Scandinavia (slaves or merchants) on the basis of ceramic assemblages. Neither Roslund, nor Jones actually illustrates the point about the ethnic attributions of archaeological material being inadequate. That Berend throws around scholarly names to create the impression that she has read widely and outside her own field results also from the recommendation she makes at the end of her reply. According to her, I would need to familiarize myself with “questions of myth-making in Romanian history writing” by reading the books of Lucian Boia (History and Myth in Romanian National Consciousness, Budapest 2001) and Charles King (The Moldovans: Romania, Russia, and the Politics of Culture, Stanford 2000). It remains unclear whether Berend ever looked up Boia’s works, especially his analysis of the literature produced during the Communist regime on the history of the Middle Ages, but I am convinced that she never opened King’s book, which deals with a topic completely different from that that Berend seems to have in mind. Berend has a major problem with the terms ‘Vlachs’ and ‘Romanians’. According to her, it was only around 1530 that Italian humanists began to make the first references to the self-designation (“Roman”) employed by people otherwise called Vlachs. Leaving aside the fallacy according to which the earliest attestation of the name is also the moment at which that name came into use, Berend apparently ignores that long before 1530, several sources mention the fact that Romanians in the Middle Ages were aware of the Latin character of their language and ethnic origin. The problem has been extensively studied by Giuliano Bonfante (Studii romeni, Rome, 1973), Şerban Papacostea (“Les Roumains et la conscience de leur romanité au Moyen Age,” in Revue Roumaine d’Histoire 4 , no. 1, 15-24), Adolf Armbruster (La romanité des Roumains. Histoire d’une idée, Bucharest, 1977), and Lorenzo Renzi (“Ancora sugli Umanisti italiani e la lingua rumena,” in Romanische Forschungen 112 , no. 1, 1-38), to mention only a few. If, as Berend seems to suggest, historians should only use the name imposed from the outside (Vlachs, in this case), and not the self-designation (Romanians), then until the modern period Romanians should have been constantly called Vlachs in all available sources. Unfortunately for Berend, that’s not the logic of the medieval authors. The problem with Berend, of course, is her own anti-Romanian feelings. There is no mention of Romanians in any of her works, either in her At the Gate of Christendom. Jews, Muslims, and ‘Pagans’ in Medieval Hungary, c. 1000-c.1300 (Cambridge, 2001) or in the chapter on the kingdom of Hungary, which she co-authored with József Laszlovsky and Béla Zsolt Szakács, for the volume Christianization and the Rise of the Christian Monarchy. Scandinavia, Central Europe and Rus’ c. 900-1200 (Cambridge/New York, 2007).